What nerd isn’t going to want to read a book entitled Raspberry Pi for Secret Agents. A cool bit of tech being used in a cool sounding setting? I’m in! 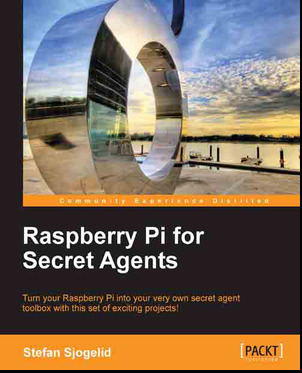 That is to say that today I will be reviewing the second edition of a book called Raspberry Pi for Secret Agents. I should probably give some disclaimer at the head of this review, I own a Raspberry Pi but I do not own all of the other hardware needed to fully play with everything laid out in this book. Having said that I have at some point or other done something similar to pretty much every project. To that end I feel comfortable enough lending my opinion to this book. I am reviewing a digital version of this book which I have been reading on an iPad. As the title suggests the premise of this book is to guide you through some projects you can do that help you play pranks or spy on people. Naturally enough this is just subtext and what you actually learn are some pretty great core concepts of developing pretty much anything on top of the Pi. Some pretty cool stuff I am sure you will agree! Stefan has a friendly way of writing, it is very personable and he distils some fairly complex ideas into something useful for the lay person. There are some things about the book that I am not so keen on. The first is that some of the execution of the book feels a bit sloppy. Here are two different screen grabs that show bad formatting. The other thing is that a lot of the things we are doing in this book could be done on any *nix machine and whilst some take advantage of the Pi, I get the feeling that others are more aimed at “Things people didn’t know you could do with Debian”. The chat bot for example was something that didn’t need to be on a Pi at all. If you have a Pi and you want some intermediate/expert projects to play with, this book could be very useful.